Through much of 2012, Glasgow synth pop trio Chvrches was making waves with a couple of singles that caught the ear of the blogsphere and saw them named as a band to watch by the BBC. 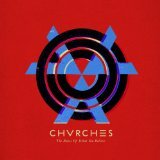 When long-time friends Iain Cooke (Aerogramme) and Martin Doherty started recording in 2011 they asked Lauren Mayberry to sing on a few tracks which lead to the formation of Chvrches. After the release of “Lies” and the equally brilliant “Mother We Share”, the music press were more than ready to embrace third single “Recover” which received high praise upon release in early 2013. Those three tracks form the backbone of debut, The Bones of What You Believe while fourth single “Gun” could easily be mistaken for an upbeat Young Galaxy. “We Sink” is instantly memorable when Mayberry sweetly declares “I’ll be in a thorn in your side ‘til you die”. Elsewhere tracks such as “Under the Tide” and “Science/Visions” show a darker side to Chvrches sound. A slew of great singles without any filler to be found, The Bones of What You Believe is one of the better debuts of the year.